If you ever wondered what the afterlife was like and got that slight pang of fear that goes shooting up your spine, well, we can completely understand that! The unknown is pretty scary. Even the word itself sounds pretty ominous. It probably didn't help that the Ancient Egyptians decided to say that Death was like a shrouded black dog that hovered over you, ready to judge your soul against the weight of a feather or clunk you with his golden staff! But, who are we to say that isn't what death looks like? Frankly, a cute black pupper is a good deal easier to deal with than the phantom robe with a slashing scythe. Still, we can probably do better. We can make that image just a little, oh, we dunno... cuter? And, as everyone knows, tiny things are adorable! So, let's take that giant, scary Anubis and shrink him down into kiddo size and, zap, we've got a totally inviting deity of death to help coax our fears. 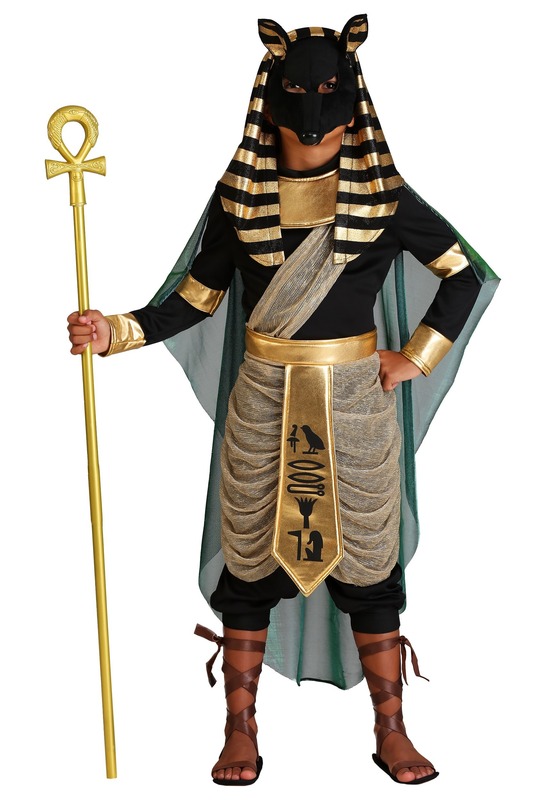 Take the first step to afterlife comfort when you give your tyke this kid's Anubis costume. Our in-house Death Cultists—believe us, they're way nicer than that name makes them sound—have worked a literal eternity to provide you with the full regalia of Anubus. We have the black and golden mask that features tall dog ears, eye holes, and a shining cowl. The collar is a shiny gold wrap that covers the top portion of your tyke's chest. The shirt is a tight long-sleeved black jersey and the matching pants have puffy harem-style legs. The sash features the same gold and black of the headpiece with Ancient Egyptian hieroglyph styled markings. Add a long teal cape and golden cuffs and your little death god is ready for work! Anubis was supposedly bound for all times to watch over the underworld and evaluate every soul that passed through his domain. We know that's a lot of work for a first-time deity, so we've worked out that your kiddo will only have to look the part until they're ready to tackle the big stuff. 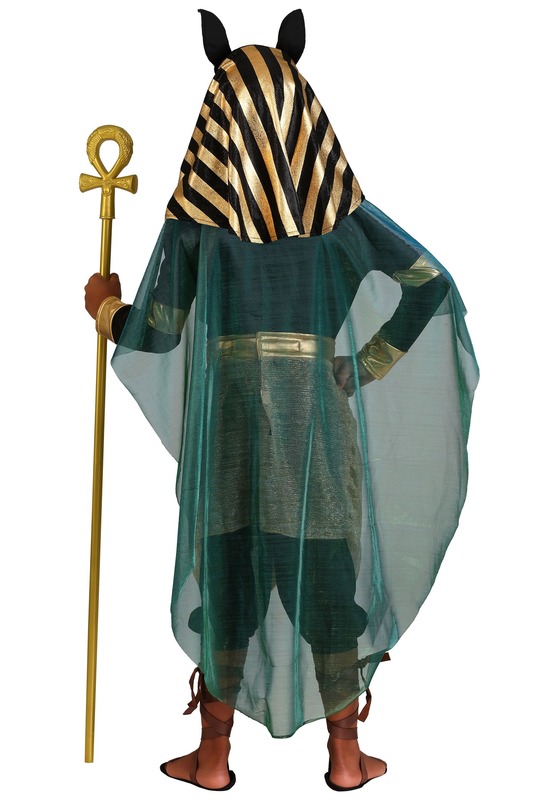 But, they're going to feel truly mighty in this Anubis look, either way!